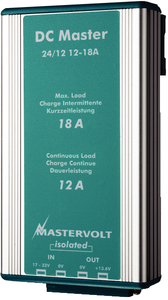 DC Master series converts 20-32VDC to 12VDC. Recreational and semi-professional use. Easy to install using included mounting bracket. Surge power available for two minute intervals, ideal for active marine telephone use. Amps: 6 continuous, 10 surge.